Our last Mummy Plus interview was a little different… As I spoke to GrandMummy Plus Sarah Beeson MBE! Sarah and I talked about her recently released baby advice book, Happy Baby, Happy Family: Learning to trust yourself and enjoy your baby, what is was like working so closely with her daughter Amy and why she thinks we are the best generation of parents yet. There is also a chance to win a signed copy of The New Arrival , Sarah’s memoir of her time training to be a nurse in Hackney in the 70s. Read Sarah’s interview to find out more and comment to be in with a chance of winning! Today’s Mummy Plus is Anna Hoffmann, who describes herself as “conserving, crafting, cooking, mothering, laughing and living in London.” Anna works full-time as a Paper Conservator as well as running her small business, Kurkuma, selling homemade ‘pretty useful gifts for babies and their parents.’ From handy bandana bibs to personalised pushchair mobiles, Anna’s creations make perfect gifts for new parents. As well as all this, Anna is also Mum to 15 month-old ‘Little C’. I caught up with Anna to find out how she fits it all in. So, you’re a Paper Conservator. That sounds fascinating. What do you do, exactly? A Paper Conservator cares for books, archives and works of art on paper. That could be actual remedial conservation if something is damaged, for example torn or dirty, but the bigger part of the work is usually to take care that damage doesn’t occur in the first place – by ensuring historic material is stored correctly, in appropriate boxes and at the correct temperature and humidity and by taking care that it is handled well, or exhibited in a way that doesn’t damage it. I specialised in the treatment of archival material and part of my work is to support the digitisation of archives and books. How did you get into that and what do you like about it? I first got interested in conservation because it is a combination of craftsmanship and science. Over the years I realised that I also like planning and implementing bigger projects as well as strategic work. My current job offers both; benchwork and more strategic work. It is a job where I can still learn and grow in many ways. You started Kurkuma when you were on maternity leave. Have you always been crafty? I’ve been crafting since I was very little – I started with folding origami boats, went on to making friendship bracelets, was introduced to knitting, crochet, embroidery and sewing by my grannies and my mum and to watercolour painting by my dad. I also did a jewellery making course when I was at school and a little bit of bookbinding – which eventually led to my profession as a paper conservator – and tried things like woodworking and pottery… Now I mainly focus on sewing and do little bit of knitting, crochet and cross stich along the way. What was the first thing you made and sold through Kurkuma? Just before I had officially started kurkuma, I made a nursing cover for myself which I took to a mum & baby yoga session. One of the mums loved it and when I told her that I had made it, she asked whether she could buy one! So this was the first item I sold… This mum became a lovely friend and she’s still a good customer. She even comes up with ideas for things I could make! You returned to work – to a brand new job! 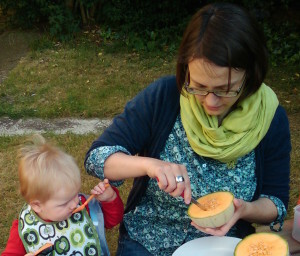 – earlier this year after a year’s maternity leave. What was it like settling into a new routine? Much easier than I expected it to be! I had heard from friends how hard they found it to return to work even if it was only part time, how badly they missed their babies and how difficult it was to settle them into nursery… So when we started, I kind of expected the worst. And none of it happened! My husband and I believe that if you don’t try, you don’t know whether you can actually do it. This is why I applied for the new job and why I started full time – and it works. I should add, it would have been much harder if not impossible, if my husband weren’t such a true ‘50/50-partner’ (great book tip: Getting to 50/50: How working parents can have it all ), or if my work wouldn’t allow me to start later than 9am on some days, and finish at 4.30pm on other days… My profession is a big part of who I am, so it felt absolutely right to go back to work, and to start that new job. What do you feel your biggest challenges are now and how have these changed? I’m pretty organised when it comes to my work but I’ve always been a bit chaotic with my private files and the household… and now that I’m a working mum it is even harder! I am a bit of a hoarder anyway and with a child there comes so much stuff, so to bring some order to my house, that is an ongoing challenge. We have a cleaning lady now, which takes away pressure but I’m just so tired at the end of the day or the week that I don’t spend enough time on tidying or ‘life admin’. This is the same for Kurkuma, sadly, and I end up spending far less time on it than I thought I would or than I would like to do because I often feel I just don’t have any energy left for it. Talking to my husband and friends is inspiring and motivating; my husband gave me a lot of inspiration around managing myself and how to get the right work done – inspired by these conversations, I’m currently reading a lot on that topic: Authors like Peter Bregman (18 Minutes: Find Your Focus, Master Distraction and Get the Right Things Done ) or David Allen (Getting Things Done: The Art of Stress-Free Productivity ) I find motivating (still trying to put it to practice though). As for my crafty side, fellow crafters and crafty friends are a big source of inspiration for me, both in ‘real life’ and via blogs and websites. But I can get inspiration from pretty much everything that surrounds me – recently I crocheted a cushion cover in the colours of a London tube station for a friend’s birthday! Little C goes to a nearby nursery five days a week, my husband and I have a rota for drop off and pick up – and little C has a jolly good time there! When I’m working on Kurkuma (which I try to do at least on some weekends), my husband would do things with Little C, for example a bike ride, so I get some time for myself. I have just under one hour’s commute, which is a good opportunity to let the day sink in and get into the right set of mind for what’s next: Family! I recently started a work diary, where I write down thoughts, good and bad things from my day at work and what I could do differently the next day. I do this on my commute back home – it takes only a few tube stops to get it done but the impact is great. It allows me to get thoughts out of my head so I don’t have to worry about it anymore. I recently joined the gym at my workplace and I find that a really good way to switch off or get a clear head – I don’t manage to go as often as I’d like to but whenever I do it, I feel great and can go home with a fresh mind (or start with one if I exercise in the morning). Probably pretty much the same… I would take more leave and go away more often with my family. I might think of getting someone to do my life admin for me ☺ And then I would take time out from my real life job to put all the ideas I have for Kurkuma into practice! If you had to describe your son in just three words, what would you say? …a happy, optimistic woman who enjoys life, a food-lover, maker of things, a little bit of a hoarder (you never know when you might need that empty glass jar and that piece of ribbon! ), an enthusiastic conservator, sometimes too perfectionist. You can browse Anna’s crafty creations at Kurkuma on Folksy and follow her on twitter @anna_kurkuma. If you find something you’d like to buy, Anna is offering free shipping (if you order from Folksy) to all Mothering Mushroom readers within the UK. Just quote “Mushroom” at the checkout and she will reimburse your shipping costs via paypal.